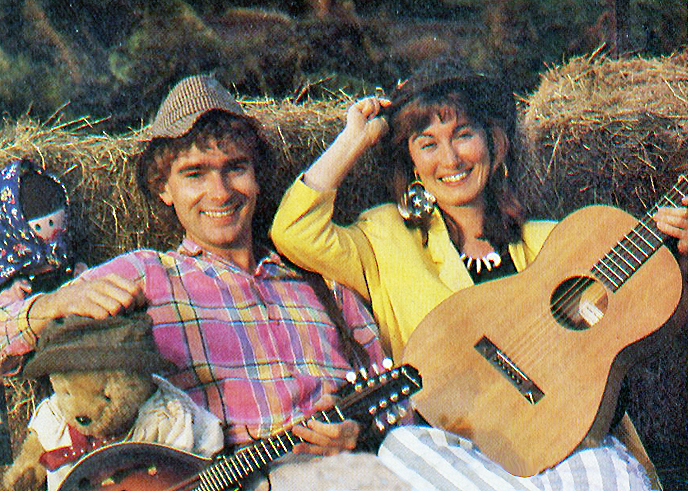 Simon and Hilary were the last guest presenters to appear on the BBC’s Play School just a few months before the doors and windows on the Play School House were finally boarded up in 1988. Twenty-seven years later the aniversary event was organised by Paul R Jackson, keeper of the Play School archives and supported by the Children’s Media Foundation. ‘After Paul rang us a couple of years ago in his search for archive material, we found this cutting from the Radio Times, written – as we recall – by John Craven. The programme was a big budget special with three days recording on a farm in deepest Hampshire, followed by an afternoon in the studio at Television Centre where we were joined on set by Fred Harris. We spent three days dancing and singing to an audience of sheep, pigs, cows, turkeys and the occasional bemused passer-by. The producer, Christine Hewitt chose three songs from our first Musical Mystery Tour album: I Like to Eat, Gobble! Gobble! Gobble! and The Fat, Fat Farmer (Timothy Tractor). She needed one more song so we set to writing the Farmyard Tango in the weekend before the recording. The crew improvised a recording studio in the farmer’s barn where we sang to a background of animal squeaks, snorts and scuffles before miming to the results. 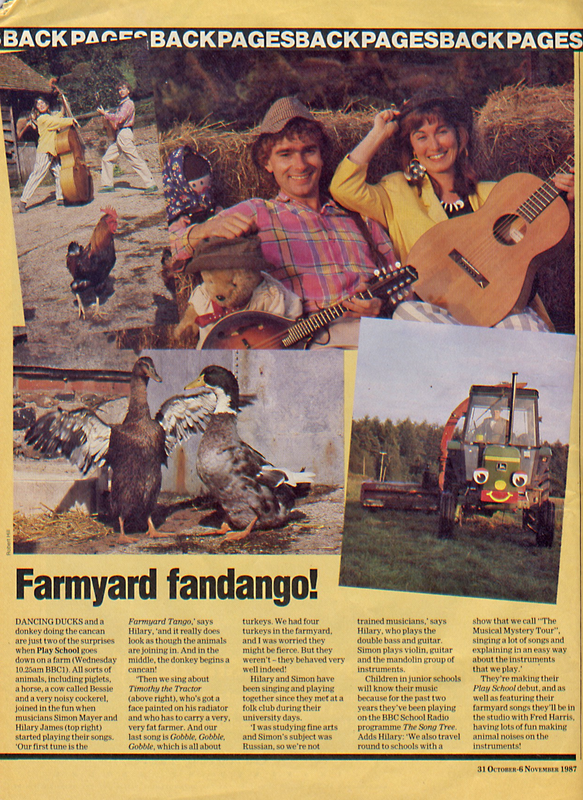 The Farmyard Tango was the trickiest mime – dancing a tango, playing the double bass and guitar and singing all at the same time. Try doing that on Strictly! The programme was broadcast on 4th November 1987. Hilary and Simon went on to write songs for BBC’s Play Days, Green Claws and Record Breakers as well as six years presenting and writing for BBC Schools Radio.